This morning we awoke to a bright sunny day which was a real treat after a few mornings of overcast skies. We’d slept well as our campground on Pine Island was away from civilisation and very quiet indeed. We’d come quite a long way off the beaten track last night to arrive here which on reflection wasn’t necessary as we were only passing through. Readied for the road we set course for Neapolitan Cove RV Park, www.neapolitancoverv.com a campground we’d seen in Naples two years ago and liked. On the way we did some shopping at both Wal-Mart and Publix www.publix.com in Fort Myers arriving in Naples www.naples-florida.com to take the only vacant pitch on the campground which was very lucky. We’re booked in for 7 nights to give us a break from the continual travelling, leaving here the day before the space shuttle ‘Endeavor’ is due to launch, giving us plenty of time to arrive in Titusville www.titusville.com . This campground is targeted at older couples rather than families with children which makes it a nice quiet place to be. We’re the poor relations on this site as currently most of the RV’s are large, expensive Class ‘A’ motorhome’s the costs of which are measured in hundreds of thousands of dollars. It was so nice to be staying somewhere for long enough to make it worthwhile getting everything out and being able to leave it out. 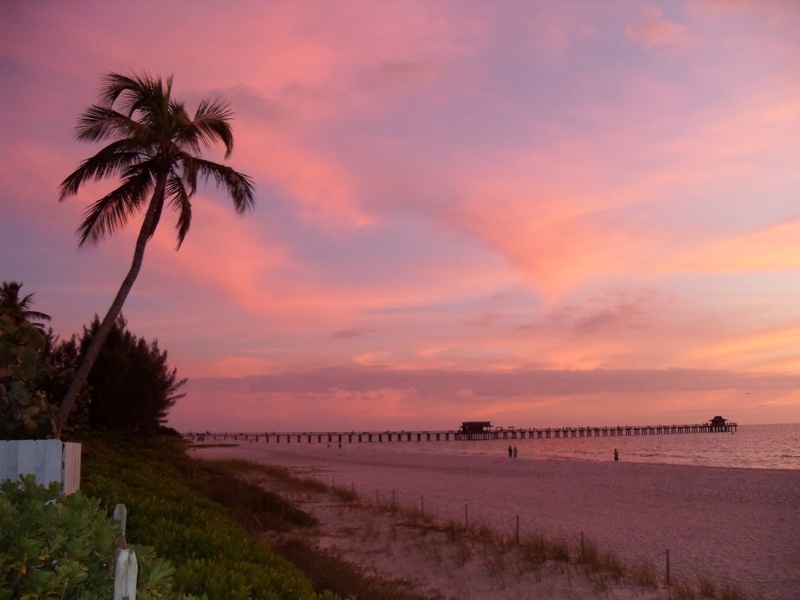 Once we were set up we decided to have a bike ride to Naples beach and take a few pictures of the sunset over the sea. We had to ride on the pavements as we didn’t have the bike lights fitted, something which will have to be addressed tomorrow. The beach and pier area were just as we remembered them. This is a lovely spot with the added bonus of having dolphins coming in very close to shore to fish. After travelling back in the dark we decided to have a quick evening meal of ham salad. Fortunately this campground allows the washing of vehicles and so I plan to wash and polish a section each day in the hope that by the end of the week we have a nice clean shiny RV. 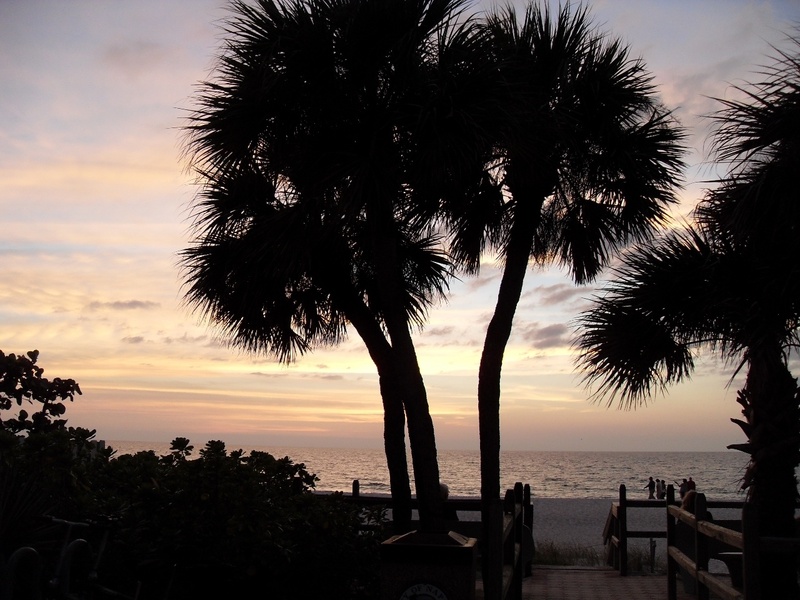 LOCATION TONIGHT: Neapolitan Cove RV Park, 3790 Tamiami Trail, E, Naples, FL 34112. Today was a long day. After showering I popped in to the Wal-Mart store to see if they sold thinning blades so that I could have a good hack at my hair as I don’t think the barber back in Atlanta touched the top at all. It desperately needs thinning and cutting, hacking it myself would be quick and cheap. Sadly they didn’t sell them and on leaving the store I noticed the newspaper headlines that Barak Obama had won the Presidential election, I was surprised at the speed of the result, given the size of the country and the number of electors. I hadn’t expected the result to be announced for another 12-24 hours. I didn’t buy the newspaper, I’m not keen on their papers but at least Americans are spared the British red-top adult comics like the Sun & Daily Mirror. For millions back home it must be a mark of adulthood to move from the Beano and Dandy to the Sun or Mirror. We left Ocala at about 09:20 and headed for Lazy Days www.lazydays.com in Tampa through whom we have our RV insured and where we nearly bought an RV a year or so ago. The purpose of this visit was to ask advice about our options regarding the RV, should we ship, store or sell it? The journey there was quite enjoyable, again the scenery was very much like Lexington, Kentucky as there were ‘Horse Farms’ everywhere and beyond that a landscape that was very much like rural Englandwith rolling green hills, woods, hedgerows, fences and fields of cattle grazing. Such a pleasant surprise as I’d expected to see far more swampland. We arrived there about 11:30, I was hungry and so had a quick munch of my tasty lunch-time sandwiches before going in to speak to the Lazy Days staff. We came away with quite a lot to think about. In preparation for possible storage we visited Big Toy Storage www.bigtoystorage.us Ricky the manager there gave us an interesting and informative tour of the excellent facility. It costs a lot more than we would like to pay since this expense has not been budgeted for. 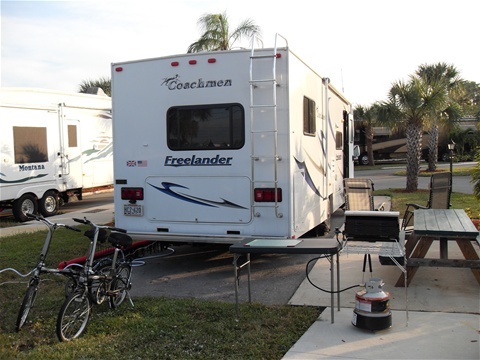 We had expected to be able to ship the RV home and sell it fairly easily, but the downturn in the world economy has changed things and it’s now about damage limitation and we have to balance cost again benefits. By now we weren‘t too happy with life, and on top of that it was another overcast warm, humid day. We felt we deserved some sunshine and so decided to head south towards Napleson the Gulf of Mexico, a place we’ve been to a couple of times before and love. We have until the 14th November to amuse ourselves before the ‘Endeavor’ space shuttle launches from the Kennedy Space Center. In the end we finished up at the KOA campground at Pine Island www.pineislandkoa.com near Fort Myer www.cityfortmyers.com and a long way from where we set out this morning. We’d just had a run of three overnight stays at Wal-Mart, and I felt we should have a campground with full facilities for the night in order to get charged up and replenished in every sense of the word. When we finally arrived having endured miles of stop-go traffic in the rush hour it was important to get set up as soon as possible and get the BBQ grill on as it was getting dark. Tummies filled we sat down and watched some TV news about the Obama victory. LOCATION TONIGHT: Pine Island Resort/KOA, 5120 Springfellow Rd, St James City, FL 33956. We hit the road about 0930 heading for Jacksonville Beach www.jacksonvillebeach.org which was somewhere I’d visited briefly whilst in the Royal Navy. It was another cloudy day with not even the promise of it brightening up later. We crossed rivers and wetlands as we travelled south. Soon after crossing from Georgia in to Florida we came across a Rest Area complete with a Visitors Center with the added bonus of free Wi-Fi which was a very nice touch and only the second time we’d come across it on our travels. So whilst Rosina did her usual tour of the leaflet stands I quickly wound the laptop up and took a look at emails and the weather forecast on www.accuweather.com . As we arrived in the Jacksonville area the traffic became very busy indeed which is understandable since the city is supposed to be the second largest in the USA after Anchorage in Alaska which surprised me. We eventually managed to find the beach road, but by then I’d lost interest in the place, it was nothing like I remembered it some 36 years ago, but having come this far I felt we should at least have a look at the sea. We pulled off in to a small public parking area, walked to the beach took a couple of pictures of the damp, windy, misty seashore and got back in the vehicle. I suggested to The Chef that we make our way towards Tampa and the Gulf of Mexico as I was getting hacked off with the Atlantic weather. By setting out right away we would miss the heavy traffic tomorrow morning. I suppose a lot of the traffic on the roads today is due to the Presidential Election and everybody needing their cars because the Polling Stations will be further than 200 yards from their homes. So off we went again heading for Ocala which is about halfway to Tampa as I didn’t fancy driving another 150 miles having already driven from Savannah. The scenery was much the same and fortunately the price of fuel continued to fall as we travelled south. We topped the tank up twice today paying as little as $2.18 a gallon, which is a lot less than the $4+ we were paying for much of our last trip. We arrived at a local Wal-Mart here in Ocala at about 16:10 and I was pleased to have arrived. Driving an RV is more tiring than a car, more concentration is needed due to the size, handling characteristics and having to think for other road users. With one of these things if you have an accident irrespective of who is to blame, you lose not only your transport but your accommodation so the stakes are higher and the responsibility greater. LOCATION TONIGHT: Wal-Mart Super, 2600 SW 19th Ave, Ocala, FL 34474.